At a time when the whole world is going crazy for the Football World Cup, 4 Asian countries are preparing to fight against each other for the Asia Cup cricket tournament starting from today. Defending champions Sri Lanka are looking favorites to win the tournament, they have won the last two Asia cup titles and this time they are playing at their home turf. It will surely help them. Sri Lanka have made two bold decisions this time. They have dropped the veteran Sanath Jayasuriya and the hero of the last Asia cup Ajantha Mendis. Now, Tilakratne Dilshan and Angelo Matthews will be the key players for them. Sri Lanka is like a second home for Team India, they have played a lot here in the last 2 years. There aren't many changes in the team, so they know how to play in these conditions. Seniors are back in the team, Sehwag's return will boost Team India's morale. After a disastrous T20 World Cup, this tournament will be a big test of Dhoni's captaincy. Pakistan's chances are not looking that much bright at the moment but they are an unpredictable side. Lots of talent but sometimes they don't play as a team. Pakistan must be expecting a lot from Shoaib Akhtar, who is returning in the team after a long time. Bangladesh can upset any team in the tournament, they are improving day by day, match by match. Tamim Iqbal has been a revelation. His knocks against England in the Test series were top-class. They have a good captain in form of Shakib-Al-Hasan. No one should make a mistake of taking Bangladesh lightly. They are a far better side now. It will be an exciting tournament. 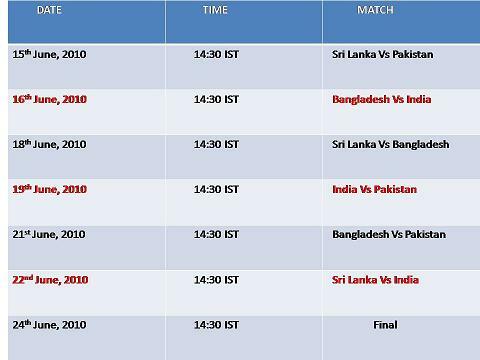 Every ball, every run, every wicket will be cheered when 4 Asian teams will fight against each other to establish their supremacy in the sub-continent.